1200×850 Tiled Look. Fully moulded laundry pod. Flat Packed. 1200×850 Tiled Look. Fully moulded laundry pod with accessories. Fully assembled with an internal pre fit. Washing machine and drier not supplied. 1200×850 Tiled Look. 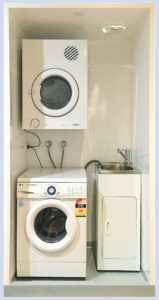 Fully moulded laundry pod with accessories. Flat Packed. Washing machine and drier not supplied.